Yoga has often been described as a fusion of well-being and spirituality, as it encourages the focus of our inner health just as much as it does our outward appearance. Stress and negative energy in our lives is mostly caused by an imbalance of the mind's thought patterns: we wander from past to future to past again, stirring up negative emotions of all sorts that leave us feeling drained and agitated. Since yoga works to calm these fears and help us focus on the present, millions of people have found it to be just what they needed to centre themselves. Below, we will outline four yoga apps that provide an excellent introduction into this holistic package for healthy living. Beginners will love iYoga+, which allows anyone to begin doing yoga exercises immediately. Billed as an app to help you rebuild strength, correct posture related issues and minimize fat build-up, iYoga+ provides dozens of videos that show its users the proper techniques for practising safe, effective yoga. Offering two levels of difficulty, the iYoga+ app includes four hours of yoga instruction and can be used as a reference tool for nearly 60 different positions. Calm your mind and help prepare yourself for the day with this free app, available for iOS devices. Those who wish to enjoy the benefits of yoga from just about anywhere will appreciate the thought that was placed into YogaCoach, an intelligent app that helps you heal mind and body. Whether you are a beginner or expert, you will be able to find custom video lessons included in the app to relieve daily stress and increase both flexibility and endurance. Developing proper breathing techniques is also part of this app's database, which helps you gain the most from your sessions. Depending on your needs, lessons can be broken down by difficulty or category, with daily yoga lessons and healing yoga lessons available. The app is $1.99 and can be found via the iTunes Store. Highly rated by a number of health publications, Yoga Pro for iPad is currently being used by more than 3,000,000 iPad users and offers an unprecedented amount of yoga training and information. With more than 300 different poses included, you will never run out of positions that can be attempted. With video, audio and 3D rendering of the poses included, you can be sure that you are doing the exercises correctly and without risk of injury. Breathing exercises and the ability to create custom yoga programs are also included. For just $0.99, Yoga Pro for iPad is one of the best deals you can find on iTunes. 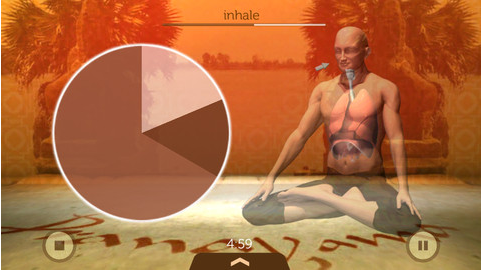 With breathing being such an integral part of proper yoga, an app dedicated to the proper techniques just makes sense. Universal Breathing gives its users the power to develop proper breathing techniques in just fifteen minutes per day. The app can track the duration of your breaths to keep you on track and 3D visualizations of the human body display proper body movement during these exercises. Available for iOS devices, this app can be purchased for $4.99. Today's guest author, Jenny Wadlow, is a freelance writer. She is an avid reader and particularly enjoys reading spiritual books.